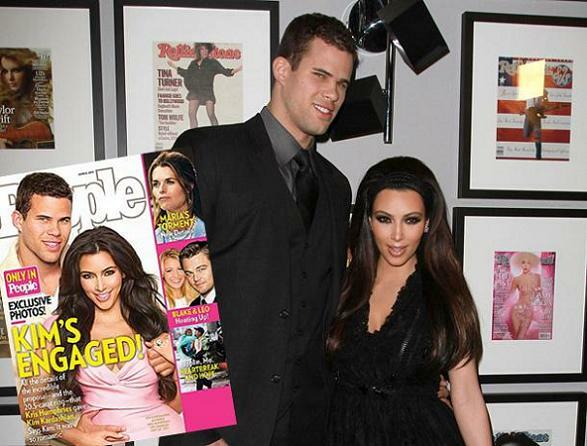 Congratulations to Kim Kardashian, who is officially engaged to be married to beau Kris Humphries. Kris proposed to Kim with a custom-designed 20.5 carat Lorraine Schwartz diamond ring. That’s twice the size of Khloe’s! "I just knew I wanted it to be big," says Humphries. You can say that again! So how did he propose? When she showed up to her Beverly Hills home on May 18th, she found him on bended knee in her bedroom with the words “Will You Marry Me?” written out in rose petals. "I didn't expect this at all," Kardashian tells People of the romantic, surprise proposal. "I was in such shock. I never thought it would happen at home, and I never thought now." With the help of Kim’s mom, Kris and Kris planned an intimate family gathering that same night to celebrate the big news. Six months and 20 carats later, Kim is about to become a married woman. Congrats to the happy couple!